Nothing says Christmas like a warm fire, a cozy blanket, a nice rich cup of hot cocoa, and…. 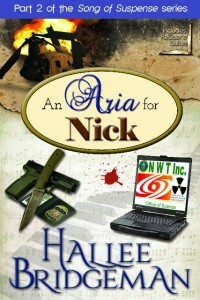 A crazy stalker killer or a nuclear espionage plot! 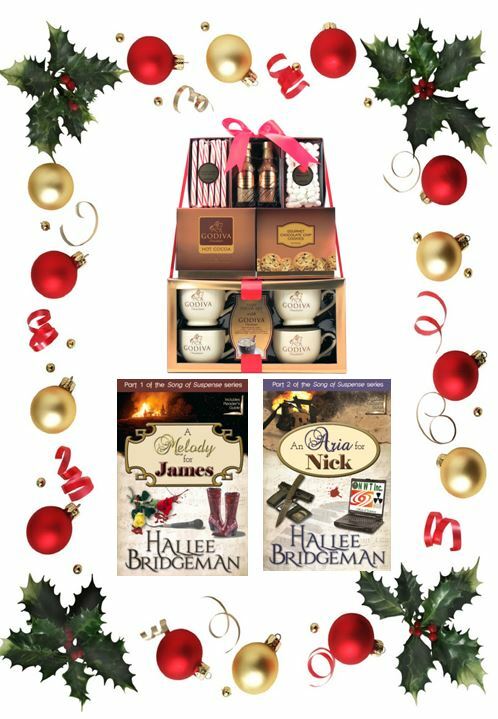 Enter to win a gift basket that contains Godiva hot cocoa and four mugs, along with books 1 and 2 in my Song of Suspense series, A Melody for James and An Aria for Nick. One winner will receive autographed copies of both books and the Godiva cocoa tower! There are 7 ways to enter to win this giveaway worth over $60. 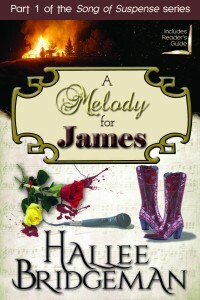 The Rafflecopter will take you through each entry. International entries are always welcome. Leave a comment on this blog telling me what your favorite part of Christmas is. Read my FREE novella, Christmas Diamond, and leave a review either on this blog or on Amazon or Goodreads. Tweet about this giveaway, adding @halleeb to the tweet. You can do this entry daily. 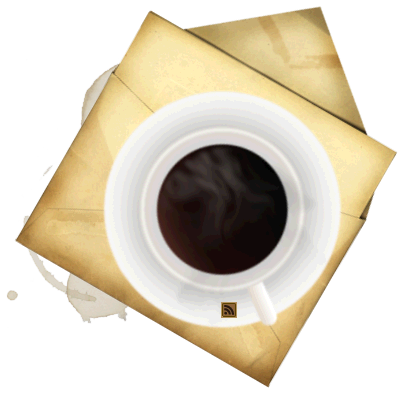 Subscribe to my RSS feed here. 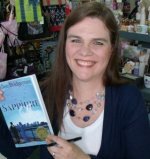 Like Hallee Bridgeman, Novelist, on Facebook here. Good luck! This giveaway ends on December 13, 2013, at 5PM EST. My favorite part is Christmas Eve with my sons. We call it the Christmas Feast-family traditional snacks and then dinner and card or board games. Topped off well past midnight by “A Muppet Christmas Carol” and more snacking, of course! Funny how the boys are slightly less enthused about the movie now that they’re in their 20’s. Merry Christmas! My favorite part of Christmas is spending time with family. My favorite part of Christmas id the family gathering, with my daughter and her husband on Christmas Eve and then with my parents and sister and brother-in-law on Christmas Day. Family is the very best part of Christmas! I LOVE to put up the tree! That, and the smell of cookies baking, is glorious! I gave a review of Christmas Diamond on Amazon. My favorite part of Christmas is the extra family time and decorating with my kids. My favorite part of Christmas is opening gifts with my family. My husband has never once been able to wait until Christmas day to open gifts – he always convinces me that we really need to open them early LOL. It is now a tradition & I love it. My favorite part of Christmas is Mass with my family – scrunched into the pews because the church is overflowing with people… Then coming home to open one present on Christmas Eve – always new pj’s – washed and ready to go! Snuggling up on the couch and watching a movie together. My favorite part of Christmas this year is going to be spending it with my Father. He hasn’t visited us in five years and just finished chemo for throat cancer. We are expecting him and his wife for Christmas so this year will be so special! My favorite part of Christmas is getting to spend time with my family. We don’t get to see each other often, so being together for the holidays is a wonderful thing! Love the fact that Jesus came because he loves me. Love Christmas music and celebrating with my Christian family! I enjoy kids, and grandkids..food and family.. In the little things..I pause and remember Christmases past..fond memories of family and friends who are now having Christmas in heaven..